Paperback, with flaps, 288 pages, 13.5 x 20.6 cm, 5.3 x 8.1 in. Our mouths are not just for smiling with, our teeth are involved in more than merely chewing, and our tongues do far more than only taste and swallow. The mouth cavity is a sensitive ecosystem and the gate to the body. Our nourishment enters the body through the mouth, we use it for speaking to other people – and it is central for the health of the entire body. A diseased mouth leads to other diseases: from irritation, fatigue and overweight through cardiovascular ailments to stroke, Alzheimer and cancer – it all begins in the mouth. 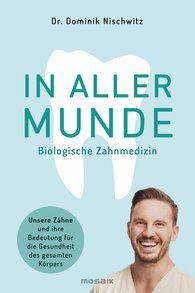 Using the latest scientific research, Dr. Dominik Nischwitz, holistic dentist and pioneer in biological dentistry, tells us everything we never knew before about our teeth, why the mouth cavity is the key to the health of the entire body and what we need to know about oral hygiene, care and nutrition.